Choli Bateka Shaak or Chawali Batata is a Gujarati style little spicy curry. Choli Bateka Shaak is easy to make. Choli Bateka Shaak also less ingredients recipe. It is made of fresh chawli beans and potatoes cooked in spices. This Choli Bateka Shaak has strong flavor of coriander seeds powder and carom seeds. These spices used in this recipe are very basic and found in every Indian household pantry. 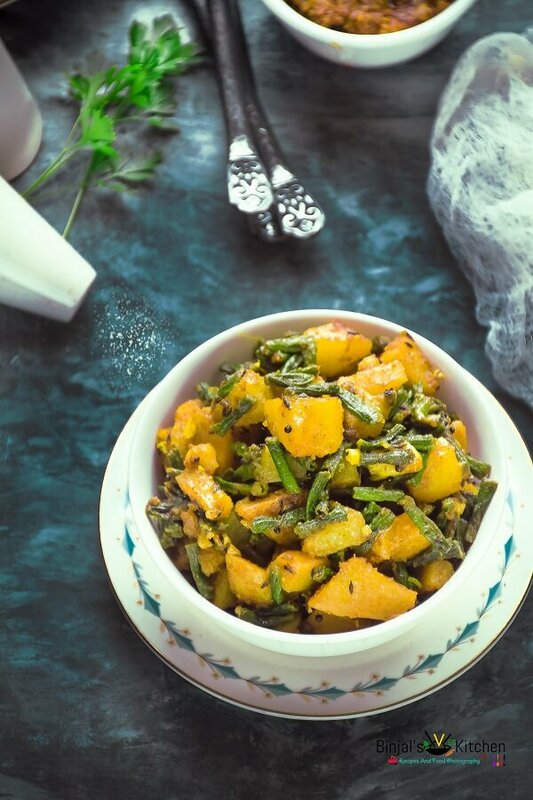 This Sabji tastes very good with chapatis and can also be served as a side veggie dish with dal and rice. Chawli/Choli/Chori beans also called snake beans, yard long beans, asparagus beans, or Chinese long beans. 1. Heat the oil in a deep pan or kadhai. Add the mustard seeds, cumin seeds and carom seeds. 2. Add garlic cloves and fry till becomes golden brown. 3. Add hing, turmeric powder, chawli, potatoes, salt and mix well and sprinkle little water. 4. Now cover the pan and cook it on slow flame for 8 to 10 minutes or till the potatoes are cooked, while stirring occasionally. 5. Add red chilli powder, coriander seeds powder, sugar and mix well and cook on medium flame for more 1-2 minutes, while stirring once in between. 6. Now add lemon juice and mix it again. Choli Bateka Shaak is ready. You can serve with roti, paratha or dal-chawal as a side. • You can add chopped onion if you like it. • If you want to make without onion garlic, then just skip the garlic. Heat the oil in a deep pan or kadhai. Add the mustard seeds, cumin seeds and carom seeds. Add garlic cloves and fry till becomes golden brown. Add hing, turmeric powder, chawli, potatoes, salt and mix well and sprinkle little water. Now cover the pan and cook it on slow flame for 8 to 10 minutes or till the potatoes are cooked, while stirring occasionally. Add red chilli powder, coriander seeds powder, sugar and mix well and cook on medium flame for more 1-2 minutes, while stirring once in between. Now add lemon juice and mix it again. Choli Bateka Shaak is ready. You can serve with roti, paratha or dal-chawal as a side.